Today a lot of old people suffer from different kinds of infirmities of old age, so called geriatrics, which often entail communication problems. People with ailments such as Parkinson's disease, Alzheimer's disease, or dementia, sooner or later, as a part of the pathological picture, lose their ability to communicate with other people using ordinary language. They cannot form and express words and sentences. Information technology has made major breakthroughs in most areas, such as work application, education, leisure, medicine and so on. By integrating some properties from several of these areas it is now possible to create a suitable tool for people with communication problems, which is possible to adjust to the particular problem of the specific user. But that requires a new perspective on Human-Computer Interaction (HCI). A clear boundary still exists between the user and the technology. This is partly because the model behind most computer applications assumes high focus and abstract thinking, and that implies using our minds as disembodied problem-solving devices. But people with communication handicaps often have problems with exactly this kind of mental activity, which underlies the use of language. And when they try and fail they get frustrated, this contributes to a vicious circle which makes their problem even worse. One approach to this problem is to loosen the boundary between the user and the computer, bringing the two parts closer together and even letting them intertwine. This article outlines a design approach for tools to help people with communication problems. The approach is based on technology developed for medicine and the defence, which makes it possible to create a tool for this target group so that they could communicate with their environment in a satisfactory way, and also a tool that makes it possible to help the people who have near contact to the patient, as for example relatives and staff at hospitals and nurseries, to understand them. Most interfaces to today's computer applications, except some applications for amusements, are directed towards abstract thinking and high-focus thought. Furthermore almost all HCI, especially applications within work, use at most only two of the human senses, the faculty of vision and sometimes hearing. But the area is now starting to include the use of other senses through the use of multimedia and virtual reality (VR), and today it is even possible, at least in theory, to use all the human senses. Then why is it important to use several senses? One answer to this question is that people do not use all of their senses equally. And especially people who have communication problem ca not express themselves by the use of regular language. They feel frustrated when they try to talk, but cannot come out with it. They try to express themselves but fail to actually form and pronounce the words and after a while they realise that they have lost that skill. Instead they get a sensation of helplessness, of not being able to have effects on the world around them, which is often a big difference compared to their former independence and in most cases having responsibility for and influence over other people. That feeling must be terrifying and also the realisation that your near and dear ones do not understand you and you cannot communicate with them. These patients then draw back into a very isolated world of their own, which consists of pain, loneliness and apathy. It is very common that they also lose their will to go on living. An important aspect of today's interfaces is that they are expressed in and use a formal language, which entails for historical reasons that the user has to use his/her high-focus and largely abstract thought. One disadvantage of this is that it limits the human self expression to abstract language ans very accurate physical interaction. This is difficult for people with a communication problem but it is not an indication of that they lost their ability to feel, think, react to stimuli and so on. Rather, it is a side effect of the origins of information technology and the applications that have been developed. In order to address this problem, it is important that applications be designed to bring forward other ways of self expression, self-discovery and understanding within the patient and others. One approach is the idea of sensational interface (described in Lindh 1997). A sensational interface has to support a new way of communication as well as both high focus and low focus thoughts. One way to support that is to use certain kinds of multimedia interaction or Virtual Reality (VR), which make it possible for an individual to use several senses at the same time to interpret and communicate with the environment. One problem with this approach is that it is hard to evaluate. One has to consider questions like; how to express information by using different kinds of senses and styles, how to measure user satisfaction, how to ensure that the interface supports communication for the actual user and also how to measure and judge the improvement of life quality for these patients. Today there is a lack of empirical evidence within this area, but the need for that is very urgent. There are also relatively few proposals to develop and evaluate sensational interfaces. One basic idea behind the proposed tool is the importance of being aware of the model behind an application. By using the ideas described in Lindh and Waterworth (1998) it is possible to deliberately design the model that the tool is based on to produce address particular characteristics of users with special needs. CharM is a model of interaction model design. It is aimed at designing or evaluating an application model intended to be used for a certain purpose. CharM consists of a 3 dimensional model of application models and a checklist for evaluation of the desired model's properties. By putting a model in the 3D space and analysing it according to the checklist it is possible to predict what styles of interaction and realisation the model is best suited for. 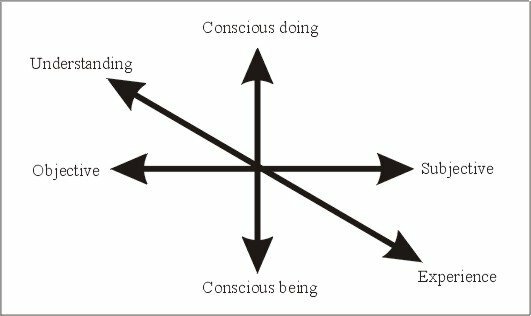 The 3D model (figure 1) depicts whether the model appeals to conscious doing or conscious being, if the model is intended to be objective or subjective and last but not least if the model is used to understand or experience something, for example an artefact, a task, or an event. Most of today's traditional computer applications are directed towards conscious doing because they appeal to abstract representation and human conceptualisation. On the other hand most computer games and computer art appeals more to conscious being - which means concrete representation and human perception (see Waterworth,1997). Another dimension of the CharM model is whether the model is to be seen as objective or subjective. The traditional computer application is intended be an objective presentation of what it depicts. The third axis of the 3D model considers whether the model is used to understand or experience a certain phenomenon or object. By having knowledge about where a model is in CharM space it is also possible to create an environment which will enhance the users' creativity and in that way create a sensational interface (Lindh 1997) which attracts both the conscious and unconscious mind of the user, which is a key aspect for people with a communication handicap. After putting the model in CharM space it is important to analyse the model according to the CharM checklist. This is done to see what implications a certain model brings with it to its intended user. The CharM checklist analyses the rationale behind the model. This article outlines a proposal for a tool used by people with communication problems to help them communication with their environment. The approach includes the idea of monitoring the users body functions as an aid for the user to express himself/herself. The expression aid should be tailored to the particular users need and ability. This means that the user can express themselves in many different ways. The CharM components allows selection and evaluation of proposed designs in relation to user's needs and capabilities and the aims of the application. Embodied communication should happen smoothly and often without the user being aware of his/her use of the tool. For the user, the fear of helpless isolation should be reduced. Another advantage is that we should be able to understand our near and dear ones, and also give them a more meaningful life where they are again a part of the world they live in. The conclusion of all this is that communication makes the world go round, and all humans are an important part of that world and should therefore be able to communicate with the rest of the world. Lindh, Eva (1997): "Sensational Interfaces: Function and Passion". STIMDI conference proceedings. Linkoping University, September 1997, pp 41-44. Lindh, Eva, Waterworth John A. (1998): "To be or not to be ... conscious". Proceedings of Consciousness Reframed: 2nd International CAiiA Research Conference, University of Wales College, Newport, UK. Waterworth, J A (1997). Back to Being: VR, the Mind in the Body and the Body in the Mind. Proceedings of Consciousness Reframed: 1st International CAiiA Research Conference, University of Wales College, Newport, UK.